When children make excessive use of video games and remain hooked on to them all the time, it can be called nothing less than the addiction to video games. It is critical to know the reasons behind their addiction to video games, as kids may otherwise become socially isolated and underachievers due to excessive game playing. Check out what majorly causes them to become video game addicts. Reality comes with its stresses and responsibilities, while fantasy takes someone away from this reality for a while. It is this world of fantasy that is provided to kids by several video games. They make a quick escape from reality when they enter the addictive environment of video games. Children sometimes become so addicted to games that they even forget their responsibilities toward their parents and careers. Kids getting easily bored of their books and studies generally look for something exciting that can offer them an interesting option. They choose video games when there is no other interesting option to pass their free time. Video games give them such an alternative that does not require provocation of thoughts. Children’s world is becoming noisier and more entertaining in all aspects of their life. Thus, they seek a source that keeps them constantly entertained. They get such a constant source of entertainment in video games. That is the reason they become more and more addicted to them. 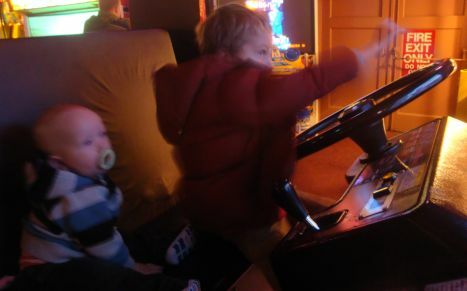 Children often find it motivating to clear different levels in games. There is a built-in reward system in almost all video games and this system is lucrative to kids. They feel that they will be praised by fellow players when they achieve something in that hypothetical world of a video game. Thus, this reward keeps them satisfied so they carry on playing to a level where they become addicted to these games.